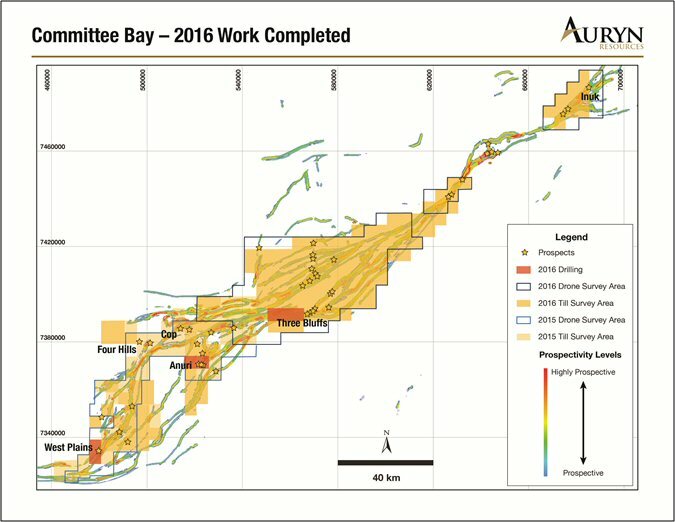 Auryn Resources Inc. ("Auryn" or the "Company") is pleased to announce partial results from its summer exploration program at the 300 km long Committee Bay Gold Project. Highlights include 13.71 meters of 1.91g/t at the Anuri prospect and 23 meters of 2.5g/t and 30 meters of 2.12g/t from the Three Bluffs deposit. During the 8 week summer program, the Company completed a major screening of the Committee Bay greenstone belt with approximately 10,000 meters of rotary air blast ("RAB") drilling, 3,750 meters of diamond drilling at the Three Bluffs deposit, 5,500 regional till samples, 3,100 XRF till samples, 1,000 line kilometers of mapped boulders and 3,500 square kilometers of drone imagery over an 8 week field season covering an estimated 85% of the belt (see figure 1). Michael Henrichsen, Chief Geologist and COO of Auryn commented, "The initial RAB exploration drill results successfully intersected structures with gold mineralization underneath till cover. This has been a critical step forward on our path to discovery as it allows us to effectively target and drill the numerous high-grade corridors that have been highlighted from our 2016 summer reconnaissance work. 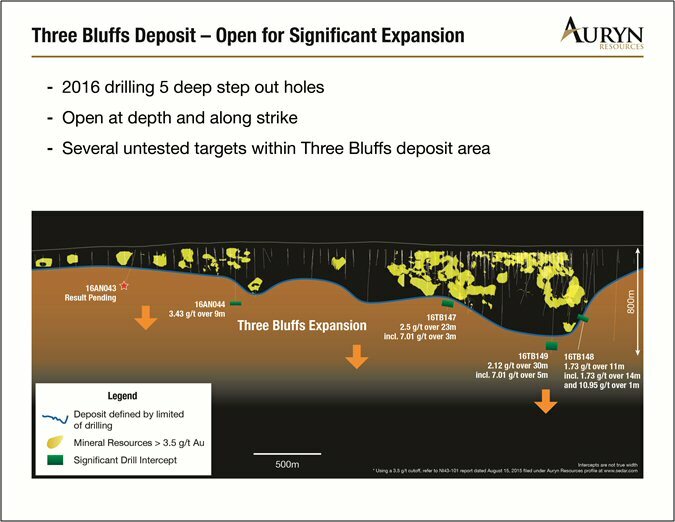 At the Three Bluffs deposit, the modest five hole drill program demonstrated that the mineralized system extends to depth and remains open. We are very pleased to see the open nature of the system and plan to re-log the deposit in 2017 to enable us to efficiently target high-grade mineralization for the next phase of Three Bluffs drilling. We were able to achieve a tremendous amount of work this summer and look forward to the remaining drill results as well as the details of the 6 new multi-kilometer high-grade target corridors that we plan to drill in our 25,000 meter Committee Bay drill program in 2017." The RAB drilling undertaken this year was designed to test new target structures underneath till cover and to drill the source rock of gold in till anomalies and mineralized boulder trains. To date 60% of the results have been received with the following highlights from Anuri, Muskox and West Plains target areas listed in the table below. The RAB drill program has approximately 30 holes yet to be released. The Company has ordered and shipped fuel for a 25,000 meter drill program in 2017 which will be focused on testing 6 significant new targets identified in the 2016 program as well as following up on current results. Shawn Wallace, President and CEO, commented " We are very pleased with the amount of work we were able to complete at our Committee Bay project this year as well as the success we have had in encountering gold mineralization beneath the till cover. Our 2017 program will be refined by what we learned this year and spread across 6 different targets that are drill ready." Mr. Wallace further stated, "With the recent acquisitions of Homestake and Banos Del Indio, we have assembled the bulk of our exploration portfolio and are now focused on the drilling and exploration of all three project areas in the coming year." Analytical samples were taken using 1/8 of each 5ft (1.52m) interval material (chips) and sent to ALS Lab in Vancouver, BC for preparation and analysis. All samples are assayed using 50g nominal weight fire assay with atomic absorption finish (Au-AA26) and multi-element four acid digest ICP-AES/ICP-MS method (ME-MS61). QA/QC programs using internal standard samples, field and lab duplicates and blanks indicate good accuracy and precision in a large majority of standards assayed. Intercepts were calculated using a minimum of a 1.0 g/t Au cut off at beginning and end of the intercept and allowing for no more than six consecutive meters of less than 1.0 g/t Au. Analytical samples were taken by sawing NQ diameter core into equal halves on site and sent one of the halves to ALS Lab in Vancouver, BC for preparation and analysis. All samples are assayed using 50g nominal weight fire assay with gravimetrical finish (Au-GRA22) and multi-element four acid digest ICP-AES/ICP-MS method (ME-MS61). QA/QC programs using internal standard samples, field and lab duplicates and blanks indicate good accuracy and precision in a large majority of standards assayed. Based on the estimated geometry of the mineralized zones, the true widths of the intervals drilled at the Three Bluff deposit are believed to be at approximately 40-75% of the drilled widths.